On the 19th March 2019 we celebrate our 7th year anniversary since we commenced trading! Another year has gone by so quickly! As always we would like to thank all that have supported us since we began trading in 2012, without the support of all our customers we would not have had 7 fantastic years of trading, we look forward to many more years in business offering our service to our regular and new customers alike. On the 19th March 2018 we celebrate our 6th year anniversary since we commenced trading! We can’t believe how quickly the time has passed! We would like to thank all that have supported us since we began trading in 2012, we have had 6 fantastic years and we look forward to many more years in business offering our service. 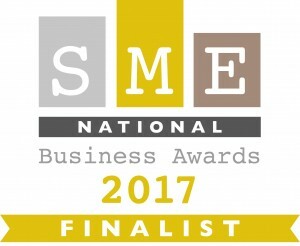 Cartridge Depot are finalists at the SME National Business Awards 2017! As winners of the SME Bedfordshire Business Awards 2017 we have made it through to the SME National Business Awards 2017 Final in the Green Award Category! This is amazing news for us, we are very proud and thankful! 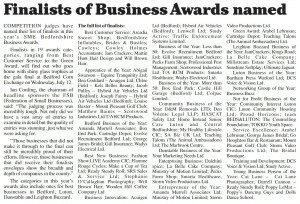 Just being in a national business awards final is a great achievement in itself! Thank you to all that have helped and supported us since we began trading! This news has also been published on the Love Bedford website. 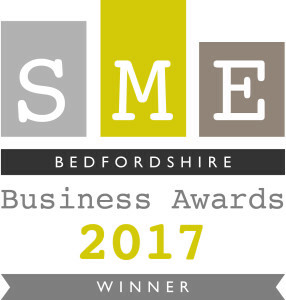 We are so proud and delighted to announce that Cartridge Depot are winners of the Green Award at the SME Bedfordshire Business Awards 2017! 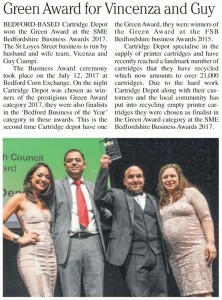 We had a great evening at the awards ceremony held at the Bedford Corn Exchange on Wednesday 12th July 2017. 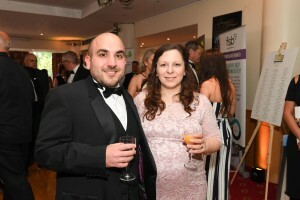 We were lucky enough to meet an array of successful and diverse businesses from around Bedfordshire at the Gala dinner and would like to thank all who supported us. We would like to extend our thanks to all our customers and the local people who have helped us achieve this award for the second time, we would not have been able to achieve it without you. 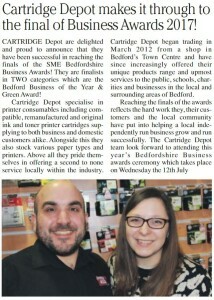 We were also finalists in the ‘Bedford Business of the Year’ category in these awards. This is such a prestigious award for us to have achieved especially as we were up against some fantastic businesses in our category, we are so grateful to have received this recognition for our hard work since we commenced trading in 2012. Cartridge Depot have reached the finals of the SME Bedfordshire Business Awards 2017! grow and who support local business like us. We look forward to the awards ceremony which takes place on 12th July 2017. It will be an evening of celebrating amongst many successful businesses across Bedfordshire. We would like to again thank all that have helped us reach this stage as it is a great achievement for us since trading just over five years ago! This news has also been published in the June 2017 edition of the Kempston Calling on page 16. On the 19th March 2017 Cartridges Depot celebrated their 5th year Anniversary since they commenced trading. 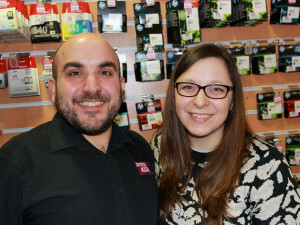 Vincenza & Gaetano Ciampa opened Cartridge Depot 5 years ago on the 19th March 2012 and have had a successful 5 years, helping local commercial and domestic customers save money on their printing costs. In these 5 years they have also played their part in helping the environment by stopping over 20,000 printer cartridges going into landfill, instead these have all been recycled. 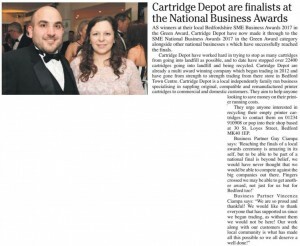 Cartridge Depot is a local independently run award winning business specialising in the supply of original, compatible and remanufactured printer cartridges, printers and paper. 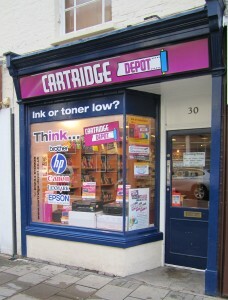 They supply many local and national customers and offer their unrivalled customer service and advice to anyone looking to save money on their printer cartridges. They offer free impartial advice to anyone interested in finding out more info and free print audits for anyone looking to try and save money on their printer running costs, no contracts or overpaying on a monthly print service, just simple one to one personal advice on how to save you money. Cartridge Depot is your one stop shop for all your printing needs, contact us now or visit our store to see how we can help you. We had an excellent time at the Awards lunch yesterday, we met an array of different businesses from all around the East of England. Unfortunately we did not win the Bedfordshire Business Champions category that we were finalists in, but we were more than privileged and proud to be chosen and invited as finalist at such a prestigious event. We would like to again thank all our customers who have supported us since we began trading, we look forward to many more milestones like this one. 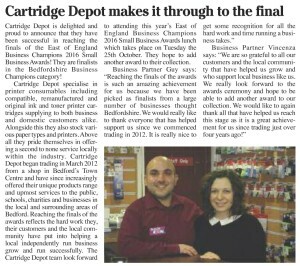 Cartridge Depot have reached the finals of the East of England Business Champions 2016 Small Business Awards! We are delighted and proud to announce that we have been successful in reaching the finals of the East of England Business Champions 2016 Small Business Awards! 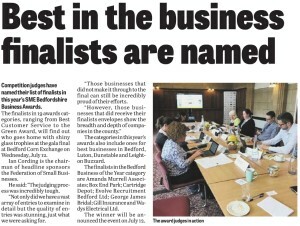 We are finalists in the Bedfordshire Business Champions category. Reaching the finals of the awards reflects the hard work we, our customers and the local community have put into helping a local independently run business grow and run successfully. We are so grateful to all our customers and the local community that have helped us grow and who support local business like us. We look forward to the awards lunch which takes place on the 25th October 2016. 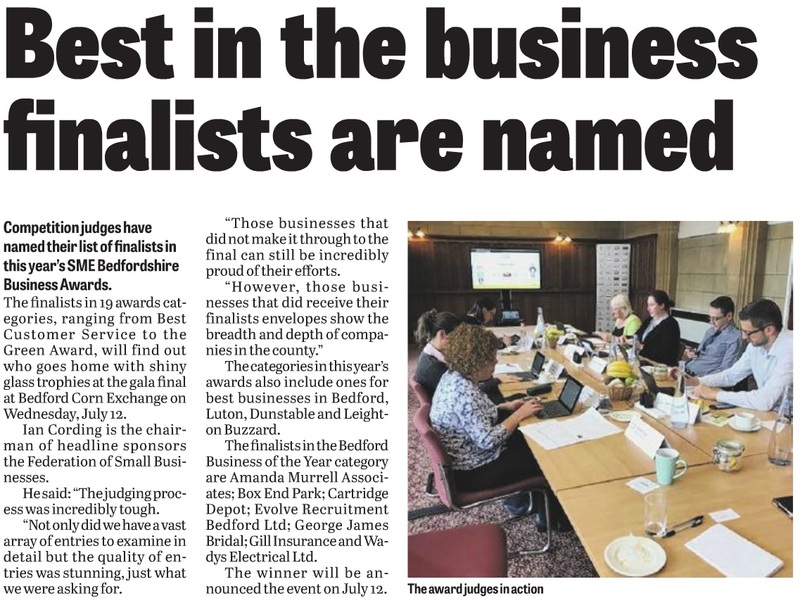 Being picked as finalist from so many businesses in Bedfordshire is an amazing achievement for us and we would like to again thank all that have helped us reach this stage since trading just over four years ago! 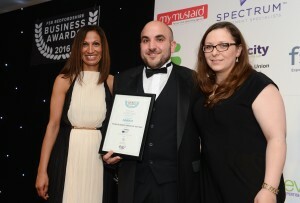 CARTRIDGE DEPOT ARE RUNNERS UP AT THE FSB BEDFORDSHIRE BUSINESS AWARDS 2016! 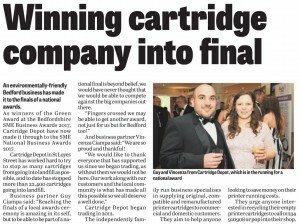 We are proud to announce that Cartridge Depot are runners up at the FSB Bedfordshire Business Awards 2016. We enjoyed a great evening at the awards ceremony on Thursday 7th July 2016 which was held at the Luton Hoo Hotel and are delighted to announce that we were runners up in our category of ‘Young Business Person of The Year’. Although we did not win the category we feel honoured and proud to have made second place in a category entered by many businesses across Bedfordshire. It was a great evening, being able to meet so many different people and successful businesses. We would like to thank all that have supported us since we began trading, without you we would have not been able to acquire this great achievement! 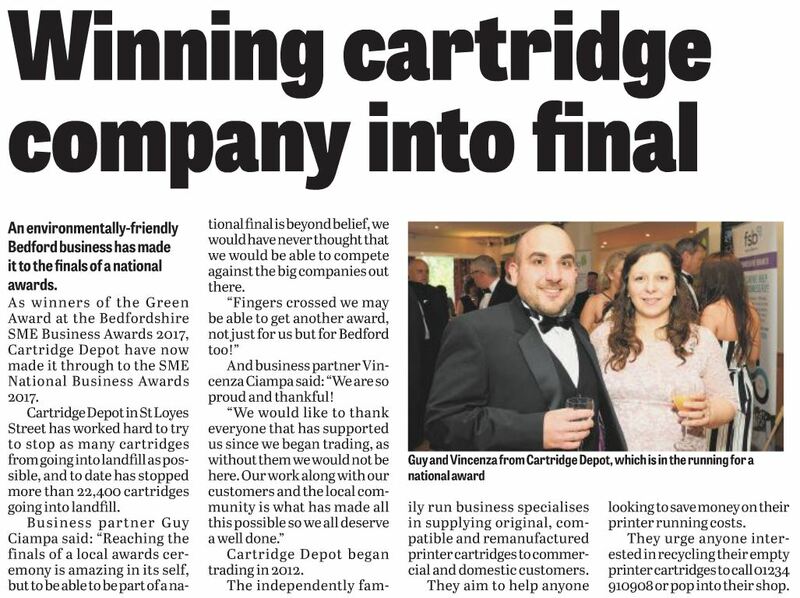 Cartridge Depot have reached the finals of the FSB Bedfordshire Business Awards 2016! We are delighted and proud to announce that for the third year running we have been successful in reaching the finals of the FSB Bedfordshire Business Awards! We are finalists in the Young Business Person of the Year category in the FSB Bedfordshire Business Awards 2016! 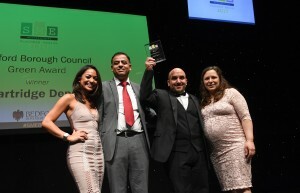 Reaching the finals of the awards reflects the hard work we, our customers and the local community have put into helping a local independently run business grow and run successfully. We are so grateful to all our customers and the local community that have helped us grow and who support local business like us. We look forward to the awards ceremony which takes place on 7th July 2016. It will be an evening of celebrating amongst many successful businesses across Bedfordshire. We would like to again thank all that have helped us reach this stage as it is a great achievement for us since trading just over four years ago!